Just in Time! New Noizepunk & Krooner! Show No. 15 of Noizepunk & Das Krooner! with Steven R. Gerber is now posted! Getcher pre-holiday fill! Early Holiday Gift! New Noizepunk & Krooner! Show No. 14 of Noizepunk & Das Krooner! with Mat Fieldes is now posted! Listen up! Just in Time for Halloween! New Noizepunk & Krooner! Show No. 13 of Noizepunk & Das Krooner! with Charles Griffin is now posted! Listen up! A New Essay from Bill Harris, Improvisation: The New Spirit in the Arts ... Read it today! New Noizepunk & Krooner Posted! Listen to Noizepunk & Das Krooner! Show #12 with Dan Cooper is now posted! Listen up! Yes, K&D returned -- live and unhinged! The live enharmonic show performed in New York on August 12 is now available for listening! Yes, K&D returned -- live and hinged! No, wait, unhinged! Kalvos and Damian gave their enharmonic show live on August 12 at Lotus Music & Dance as part of Tom Hamilton's Cooler in the Shade series. Show #538. Best performance on i cried in the sun aïda ever, and hell of a Utopiano too. Double Yeah! Yes, K&D returns -- live! ... but not on the air. 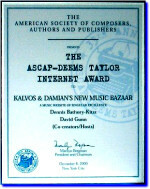 Kalvos and Damian are appearing live on August 12, 2006, at Lotus Music & Dance as part of Tom Hamilton's Cooler in the Shade series with "Kalvos & Damian: Live and Unhinged." Indeed, David Gunn and Dennis Báthory-Kitsz will reprise the erstwhile K&D radio show as a live concert event on August 12, including performances by themselves and Beth Griffith, Lydia Busler-Blais, Jacqueline Martelle, and Joseph Kubera. Show #538. Yeah! Listen to our successor show, Noizepunk & Das Krooner! Lots of new guests, fun, and fast-paced unKalvosian dialog! Gene Pritsker and Charles Coleman host the show. You'll be able to listen right here -- no, not live but good as it gets from their studios in Manhattan, exclusive on kalvos.org! Ready, set... listen to Shows #1-10! Dennis has a blog for his "We Are All Mozart" project. He riled you up with musical politics on K&D, and now does it again on a near-daily basis. Read it and grind your teeth. Photos, too. Just a couple of things we'll expand on later... We have some new online-only shows coming up on K&D, with Rozalie Hirs, Riccardo dal Farra and many others. We'll announce them -- watch for them. Also, we're about to present a loyalty award to our most dedicated composer-contributor, whose monthly tithe has helped keep K&D alive over the years. The award will be to composer and radio host Canary Burton, and we'll tell you much more in the next few weeks. Not many changes here yet. Please note that there are few changes on the K&D site yet. Our forum was being abused by spammers, so it is closed. The old links pages are still up and will be kept as an inactive archive, as part of our chronicle of the NonPop revolution. So will all the composer pages, with links to their own home pages. Naturally, the audio clips will remain in their original formats. Artists move on and don't take care of their histories. K&D showed you who they were then, live and in real time, and continue to reveal them as they develop.